One of my Colorado cousins made this breakfast egg and bread casserole when we were guests in her home. It was wonderful and I made it just the way she did for a time. She included 1 tablespoon Worcestershire sauce and a small onion (about 1/3 cup) diced finely. Then I got acquainted with church kitchens and things changed! First to go, of course, were the onions and the Worcestershire sauce. Some people didn’t like onions and some couldn’t handle the peppery flavor of the Worcestershire. But the heart and warmth was still there. This is a very popular dish for youth groups to prepare when they are charged with providing Easter breakfast. It is perfect for that because it can be made the night before and is easy to make by kids who have little to no kitchen experience. The recipe continued to evolve mostly through necessity. Like using donated ingredients. The original recipe called for eight slices of bread. Do you know how many varieties of bread in how many different sizes Moms have on hand when a teen tells them they need a loaf of bread in half an hour? Hence the cubes and measurements. If the bread is moist, go for the full four cups, if it is on the dry side lean more toward 3/12 cups. Same with cheese. Have slices instead of shreds? A sharp knife and quick work makes two cups of strips. Not enough cheddar. Any yellow cheese will work. Somebody brings in mozzarella or Swiss? Mix it in with the yellow cheese. And divide it among a couple of batches. Lesson learned? Everyone is welcome and whatever you have to contribute to the group is important! One church full of great cooks with many years of experience documented their favorites well. The casseroles were setting on the counter waiting for me to put them in the refrigerator while we closed our youth meeting. One of the octogenarians noted for her culinary skill, generous heart and frugal ways was hanging around in the background as the kids charged out. We chatted as I broke out the aluminum foil. Then she asked me if we had used the recipe from the notebook in the drawer. Oh yes, mam, I said, we followed it perfectly. Well, honey, she said, I always add one more. One more what? I asked. Whatever it needs, she said. And that day, Gladys taught me to tilt the pans. If the bread was moist and some of the custard collected in the corner, all was well. If the bread looked dry and there was no excess custard, we mixed more custard using one egg to half a cup of milk and added it to the pan. A bare spot got a handful of cheese. When the casseroles suited her, I prepared to add the foil. Gladys asked if I had butter. Uh no – there is some margarine in the refrigerator to slice over the top. Why? Because, Gladys said, you need to melt a stick of butter for each of those pans and pour the whole thing over the top. Use the best and be generous. Now, there’ll be some butter in the refrigerator when you come in the morning. I’ll pick up some when I get the expired bread from the grocery for the homeless shelter tonight. You’re welcome, honey. Gladys patted my arm, wisped up the stairs and out the door to the next good deed. Isn’t that a perfect lesson for Easter Morn?? One more thing — given generously. And that’s why there are seven eggs in this recipe’s final version instead of the original six. 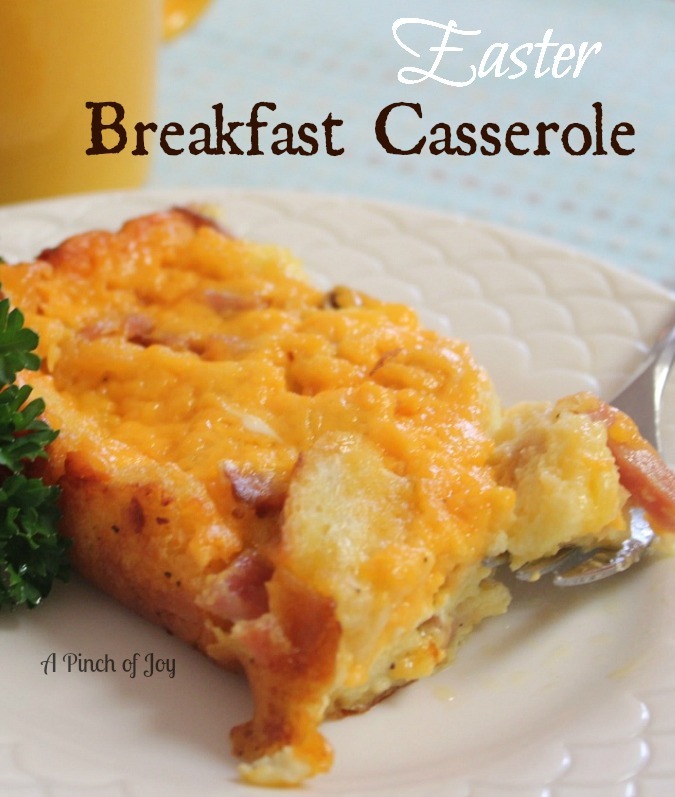 A hearty, hot breakfast casserole perfect anytime. Break or cut bread into bite sized cubes. Place in a greased 9x13 inch baking dish. Dice ham into small cubes between ½ and ¼ inches to make 1 cup. Layer evenly over bread cubes. Sprinkle cheese evenly over bread and ham. Combine eggs, milk and salt, whisking until well mixed. Pour over bread, ham and cheese layers. Cover with aluminum foil and refrigerate overnight. Remove foil, melt butter and pour over top of casserole before baking. Bake at 350 degrees for 45 minutes or until golden brown and set in the middle.